Sunlight bounces off the water of Diamantina Creek as it cascades over a series of granite boulders and a pair of bright red dragonflies buzz by millimetres above the surface. An iridescent blue Ulysses butterfly wafts lazily past before alighting on a nearby rock, and a gentle bubbling tells me the coffee is ready. The fact that we’ve brought a stovetop coffee maker on a multi-day hike marks us out squarely as hipster hikers, but this brew tastes better than anything they’re serving in Melbourne’s laneways. The fresh creek water we’ve used is as pure as it gets, and I’ve just had my third swim of the day before morning tea. As I stretch out to dry on a sun-warmed rock, I find myself wishing that I could stay a little longer. It’s the morning of the fourth (and second-last) day of our hike along the Thorsborne Trail, a path that traverses Hinchinbrook Island’s rugged east coast. Though it’s only 32 kilometres long we’ve given ourselves five days to tackle the distance, including a rest day at South Zoe Creek. Swim number one is just 10 minutes from the campsite here, which can be reached by boat and is thus the most visited spot on the island (only 40 walkers are allowed on the Thorsborne at any given time). A path leads from the beach through lush rainforest – so thick it almost blocks out direct sunlight – until we descend to a rocky creek crossing, and the trees part to reveal a broad amphitheatre framing a large circular pool fed by a waterfall. Swing ropes and a population of inquisitive jungle carp make it a fun place to spend an afternoon, which is exactly what I did on the previous day while living out my island fantasy by cracking coconuts open on the rocks and greedily drinking the juice. But with a full day of hiking ahead, we just have time for a quick dip before scrambling up the steep escarpment behind the waterfall. It’s sweaty work with full packs, and at one point we have to haul ourselves up hand over hand with the help of a rope before we emerge onto a slab of pink granite that gleams in the sunlight, worn smooth by the passage of water over innumerable wet seasons. Here we’re afforded what might be the best view on all of Hinchinbrook Island. 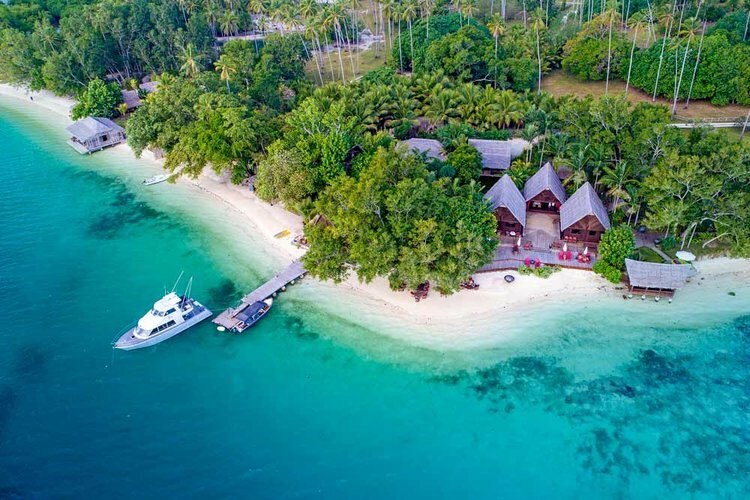 The mangrove-lined South Zoe Creek spills into a broad bay surrounded by verdant mountains covered in rainforest that bursts with every imaginable shade of green. Turquoise water sparkles in the morning sun and laps at a small arc of sand. Behind the vegetation at the sand’s edge lies a flat expanse of paperbark swamp, and a gentle slope leading up to the ridge that blocks the view beyond. We’ve already traversed this part of the Thorsborne Trail, but the path itself remains hidden in the thick vegetation and it’s satisfying to see the untrammelled, undeveloped nature of the country we’ve passed through. It also explains why progress is so slow: the trail’s well-marked 32 kilometres include black swamps, boulder-strewn beaches, thick jungle and dense stands of mangroves. Combined with a narrow track that is sometimes little more than rocks and roots, it makes for slow going at times. Despite that, our group (which includes three first-time hikers) is in high spirits. That may have something to do with the natural infinity pool we’re sitting in while we take in this spectacular view. The hike is not without its challenges. At night the insects are voracious, and an abundance of sharp-toothed native rats mean that all food needs to be packed in safe boxes or they’ll gnaw through tents and packs. Hikers need to be entirely self-sufficient, including carrying all rubbish out, but the natural beauty of this vast and wildly diverse island makes it all worthwhile. For most of its length the Thorsborne Trail hugs the coast, and the highest elevation point is 260 metres. From here we can look out over the neighbouring islands, but the mountains at the centre of the island still tower far above. Vegetation covers all but their very steepest slopes, and in the morning when they’re shrouded in a thin mist it feels like I could be looking at the rugged peaks of the Cairngorms in the Scottish Highlands. But if I wait until the clouds have blown off, and add some sand and waving coconut palms in the foreground, then suddenly the scene looks more like a volcanic South Pacific island. With ever changing views like these, there’s no chance of being bored. Back on day four, we trek through open woodland where shaggy yacca and she-oaks rise between huge slabs of granite, occasionally descending into gullies that have been overtaken by seriously dense jungle. In these patches the humidity is almost a physical presence as we hike through streambeds and over moss-covered logs, avoiding the spike-covered vines that hang down ready to pluck off our sunglasses and hats. There’s a real Indiana Jones feel to the jungle trekking, as if we’re the first visitors in years – and though it’s only been a few hours since my last swim I’m already craving another. So when we descend a steep path that leads to an open lowland forest and I can hear another waterfall in the distance, my response is almost Pavlovian. Soon I’ve shed my pack and I’m in the water again, my aches from the day forgotten as I splash around and allow the falling water to land on my shoulders and massage them. Before long the others have joined me, and I wonder if there has ever been a cleaner bunch of campers! It’s been far from a typical hiking day, but the Thorsborne Trail is far from a typical hike. The undeveloped nature of Hinchinbrook Island makes it feel like we’re completely cut off from civilisation. Just a tiny fraction of the island is accessible to visitors, and most of that can only be seen by hiking the Thorsborne Trail. Thanks to the permit system, we never see more than three other hikers on any given day, and for long periods it feels as if we could be the only people on the island. With the exception of a defunct resort that is being swiftly reclaimed by the jungle, the only structures on Hinchinbrook are the drop toilets at some of the campsites. And, for four brief nights, our tents, as we hike through this island paradise. Hinchinbrook is the largest island on the Great Barrier Reef, and Australia’s largest island national park. With more than 30 species of mangrove identified, it has some of the most diverse mangrove forests in the world. When Captain Cook sailed past in 1770 he mistook the island for part of the Australian landmass, due to its mountainous terrain and proximity to the mainland. Hinchinbrook Island can be accessed from Lucinda, 140km north of Townsville and 250km south of Cairns. 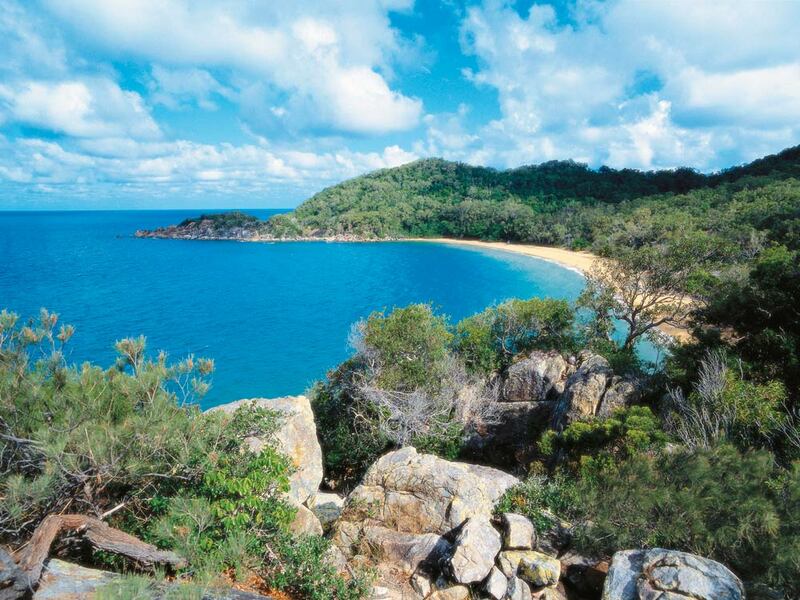 Campsites cost $6.55 per person per night and can be booked through the Queensland National Parks website. Plan ahead as they book out months in advance during school holidays.